AKT1, AKT2, and AKT3 from other species may also be detectable. 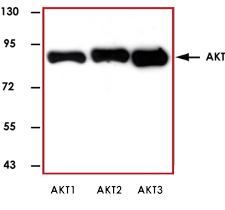 Sample Data :Representative western blot with Anti-AKT (pan) (1:1000) using 20 ng of human recombinant AKT1, AKT2, and AKT3. 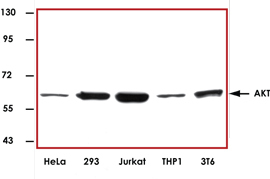 Sample Data :Representative western blot with Anti-AKT (pan) (1:1000) using 30 μg of HeLa, HEK-293T, Jurkat, THP1, and 3T6 cell lysate. Scientific Background :Akt, also referred to as PKB or Rac, plays a critical role in controlling survival and apoptosis. This protein kinase is activated by insulin and various growth and survival factors to function in a wortmannin-sensitive pathway involving PI3 kinase. Akt is activated by phospholipid binding and activation loop phosphorylation at Thr308 by PDK1 and by phosphorylation within the carboxy terminus at Ser473 (1). 1. Anderson, KE. et al: Translocation of PDK-1 to the plasma membrane is important in allowing PDK-1 to activate protein kinase B. Curr Biol. 1998 Jun 4;8(12): 684-91.